Lexington KY – May 20, 2011 – Today, the sun was shining for competitors at the Kentucky Spring Classic, held at the beautiful Kentucky Horse Park. 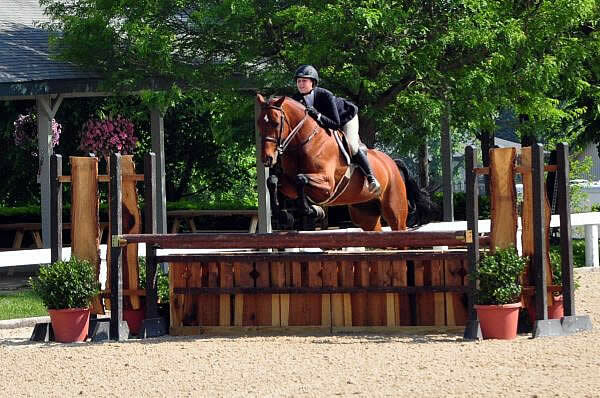 In the Stonelea Arena, junior riders competed in the USEF/Pessoa Hunter Seat Medal and the WIHS Hunter Phase. The USEF/Pessoa Hunter Medal title went to Greer Hindle, while the WIHS Hunter Phase was won by Hayley Barnhill. Twenty-five riders showed over a course consisting of nine jumps. Riders started out down the diagonal away from the gate with a seven stride vertical to an oxer. Then, riders came up the opposite diagonal over the wall and back down the opposite diagonal over a single vertical, and around to the outside two stride vertical to an oxer. From there, they continued down to the single vertical on the diagonal line and up the outside five stride vertical to an oxer. Four riders were invited back in the ring for the final test. After they lined up, the judges instructed them to canter fences four and seven, counter canter fence eight, hand gallop fence two, halt, and return to the line at a sitting trot.